Scholarship on the history of West Germanys educational system has traditionally portrayed the postwar period of Allied occupation as a failure and the following decades as a time of pedagogical stagnation. Two decades after World War II, however, the Federal Republic had become a stable democracy, a member of NATO, and a close ally of the West. Had the schools really failed to contribute to this remarkable transformation of German society and political culture? 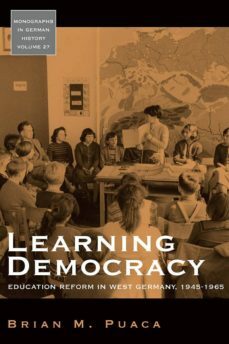 This study persuasively argues that long before the protest movements of the late 1960s, the West German educational system was undergoing meaningful reform from within. Although politicians and intellectual elites paid little attention to education after 1945, administrators, teachers, and pupils initiated significant changes in schools at the local level. The work of these actors resulted in an array of democratic reforms that signaled a departure from the authoritarian and nationalistic legacies of the past. The establishment of exchange programs between the United States and West Germany, the formation of student government organizations and student newspapers, the publication of revised history and civics textbooks, the expansion of teacher training programs, and the creation of a Social Studies curriculum all contributed to the advent of a new German educational system following World War II. The subtle, incremental reforms inaugurated during the first two postwar decades prepared a new generation of young Germans for their responsibilities as citizens of a democratic state.